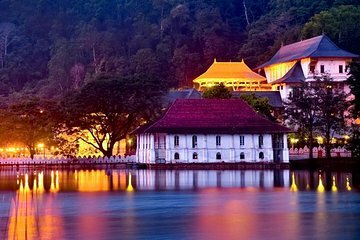 Visiting Kandy from Colombo independently means going by cab, bus, or train: leaving you transport-less once there. This private tour fills the gap: with private transport and guided sightseeing in the hill capital. See the Temple of the Tooth, botanical gardens, and a cultural show; discover facts you might miss alone; and visit an elephant project on route—not possible when going by train. Hotel or airport transfers are included. We had a fantastic day trip even though it was a long day... thanks to Kumar who was an excellent driver and guide. He ensured we covered up all important places... the elephant Safari was a highlight that we did..